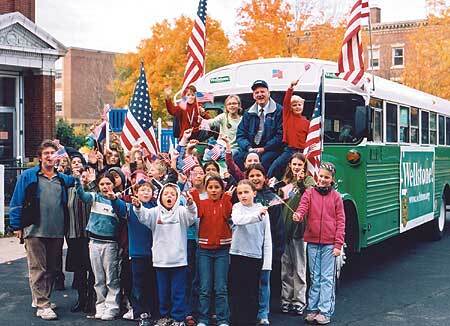 The Magic Green School Bus is an engaging half-hour documentary about the late teacher and senator from Minnesota, Paul Wellstone. �The film was created by a class of fourth, fifth and sixth grade students at Lake Country Montessori School in Minneapolis working with their teacher Malinda Holte and the artist Media Mike Hazard. It is for people of all ages. 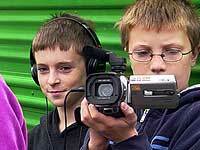 Louis Umbarger on sound and Corky Harrer on camera, recording for The Magic Green School Bus. The film features interviews with Mark Anderson, Jeff Blodgett, Pam Christian, Pakou Hang, Bill Holm, Rick Kahn, Connie Lewis, Jim Ramstad and Paul Scott. Music is by Mason Jennings, Larry Long, Larry McDonough and the students. 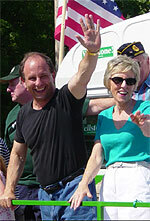 For more about Paul Wellstone, go to Wellstone Action.